Funky and proudly Pinoy creations by our homegrown designers, artists and institutions. Just-Tiis League by Electrolychee. Click for more designs and read what the artists had to say about their works. 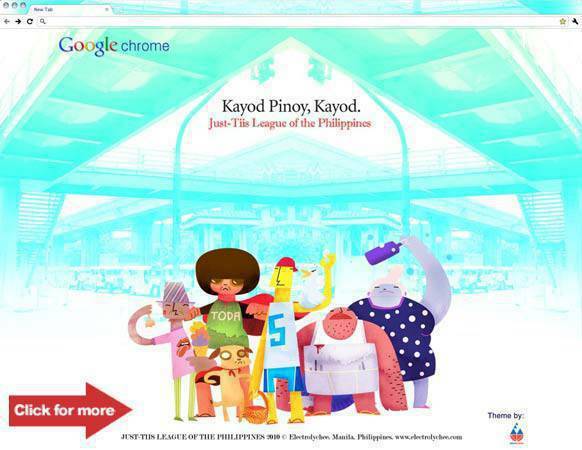 With the latest and fastest version of the web browser Google Chrome comes 13 Pinoy themes created by local artists, designers and institutions. Selected based on their contribution to the Philippine art community and promotion of the local culture, they designed works of art that showcase the Pinoy way of life. The chosen 13 are artist-activist-tour-guide Carlos Celdran; graphic design studio Team Manila; graphic artist Arnold Arre; the School of Fashion and the Arts; fashion house Aranaz Bags; illustrators AJ Dimarucot, Corey Cruz, Dan Matutina, Drew Europeo, Karen Gosingan and Paul Guadalupe; design company Electrolychee; and social change organization Yabang Pinoy. "Google is giving the public a chance to upload their own themes through the Google Chrome Extensions Gallery. Those who have the knowledge to develop extensions can also publish their extensions," Derek Callow, Google South East Asia’s head of marketing, said. "To get started, users can check out the tutorial." Photos courtesy of Team Asia.